ESEE Knives, formerly R.A.T Cutlery is one of the most well-regarded cutlers in the USA, a cutler with a strong reputation for quality, and with the owners Jeff Randall and Mike Perrin standing by their products no matter what. Their personal integrity is renowned, highly respected and never disputed. Despite having looked I have yet to find a single complaint against them. Quite the contrary, I can find nothing but praise for this company. Why is that? The answer is simple; we believe that American consumers, as a whole, are honest people. Their goal described below further instills a lot of respect and combined with the above creates a very strong profile built on credibility and honesty. We got in this business to show the consumer and the knife industry that it is possible to make a superior product for an affordable price. We will never back off of that philosophy. We simply saw a need that wasn’t being filled when it came to real-world gear and training. There’s a ton of good gear out there, but many gear companies lack the ‘hands-on’ training to back up their designs. ESEE is changing the way a knife and gear customer looks at what they’re buying or trusting their life to. We personally field test each new design prototype before is makes it to the production stage. Once we make the final design tweaks and the knife is put into production, we test the design again during field outings Stateside and jungle survival classes in the Peruvian Amazon. They designed a knife to fulfill their own demands and needs called the RTAK, which was first manufactured by Newt Livesay of Wicked Knife Co and to their surprise, the knife became quite popular. In 2002 they licensed Ontario Knives Company to produce the RTAK knife on a 5-year contract, and also designed the RTAK II, the TAK, the RAT-3, RAT-5 and RAT-7 as well as the Model 1 and Model II folders to be manufactured by the Ontario Knives Company during this period. In 2010 they changed their cutlery name to ESEE Knives2 and began producing their own knives under their own brand and with that the two companies parted ways completely. All ESEE knives except the Lite Machete3 and the ESEE/Becker cooking knives are produced by famous Rowen Manufacturing in Idaho Falls, Idaho. Rowen is another respected company that is known for manufacturing excellent blades with very good heat treating and the collaboration with ESEE goes back all the way to the RAT Cutlery days. Rowen also used to make blades for Tops Knives, another renowned high-end cutler who also manufactured the RAT Laser Strike many years ago. Neither company works with Tops Knives today though. 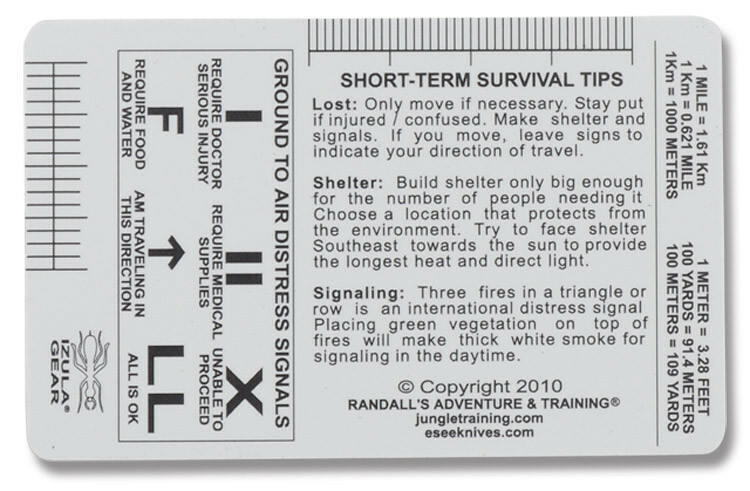 Included with the knives come neat little plastic cards with tips on survival that can be carried in your wallet or your pack. These cards come in several different variants that can also be bought separately. Here is one example. These knives aren’t specific bushcraft knives, but more wilderness survival knives, designed for that particular context and very much for reliability, but somewhat less for versatility, although they are certainly more than serviceable in most contexts. The only ‘fancy’ aspect of these knives is the quality. There are no gadgets or ‘cool’ features to the knives. Instead they are designed for what a knife is really only supposted to do; to cut, chop, slice and pierce. All these knives are full tang, meaning the blade extends as a broad, solid and strong piece of steel from point to end. This is a good thing as it means less risk of breaking at the tang. In this case, and as is most common, the tang is visible all the way. However in cold climates this is less suitable as naked steel against exposed skin is not so good. A hidden tang is better for such climates. Still, as these aren’t originally designed for Nordic climates, this comes as no surprise. And for most of the year it is of no concern, especially those parts where people tend to stay outdoors. Also, there is an advantage in having the grip designed like this, in that you can actually carefully baton the handle if it gets stuck in a log. The handles are the same on the ESEE-5 and ESEE-6 and is quite comfortable, made out of micarta, although the ESEE-4 can also be had in G104 . All these knives can all be held in any grip, making them very nice to work with, even with various reversed and inverted grips. In fact, they are surprisingly comfortable in any grip, despite their angular and curved shapes. That said, the scales can be easily removed and replaced with a simple hex wrench. And there are makers who market custom made scales (and sheaths) for these knives, but you could also make your own out of some nice wood. The standard blades are made out of 1095 non-stainless steel that is texture powder coated for protection against corrosion. 1095 is a good steel and with the hardening used (55-57 HRc) has good edge retention while still being easy to sharpen. However, keep in mind that it rusts easily and needs to be maintained properly, also on the laser-engraved text, or you will see rust developing quickly. The blades all have a spine with grooves for thumb jimping so you can use your thumb better to press down along the spine of the blade when carving. While the ESEE-4 and ESEE-6 have distinct indented choils for the index finger, this is far less distinct on the ESEE-5. All three blades come in plain or partially serrated edges sharpened at 20 degrees per side. 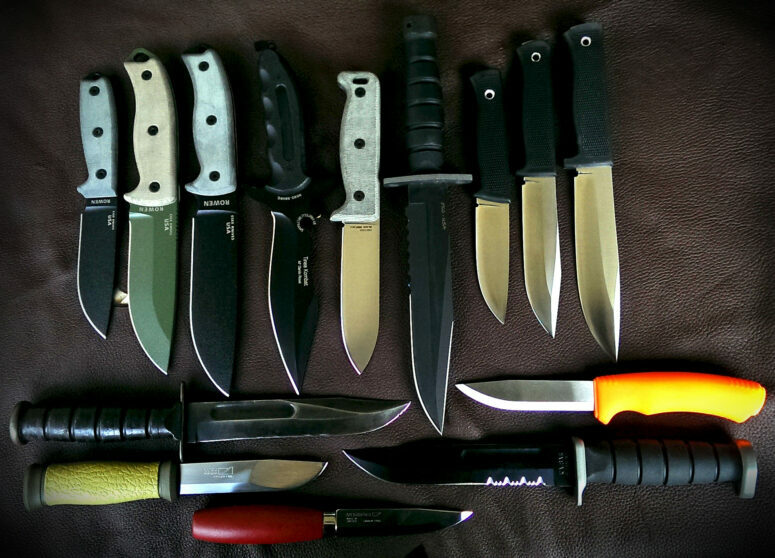 Some older variants of these knives had a partially sharpened spine, but the current ones don’t. The pommel has a lanyard hole and on the ESEE-4 and ESEE-6 is rounded, while on the ESEE-5 it is designed to be used as a glass-breaker. The ESEE-5 sheaths are made out of kydex, while the ESEE-4 & ESEE-6 sheaths are made out of seemingly less durable plastic. They are attached with an included clip plate or MOLLE locks. Some configurations also include the option of, using a Phillips screwdriver, attaching a nylon MOLLE-compatible attachment system, called the MOLLE back, and which allows you to carry it on your pack or on your belt in various ways and which can be set up both for right- and lefthanded users. They are not the prettiest of sheaths, but very well-designed, utilitarian, durable and fulfill the two basic requirements: They stay securely on your belt/pack and the knife doesn’t come loose even with the retention strap open. This, rather surprisingly, many cutlers fail at, but ESEE succeeds with a very good margin. The ESEE-5 and ESEE-6 Molle back, to which the kydex sheaths are fastened using Phillips screws. The sheaths all have pommel covers. In the case of the ESEE-4 it is a simple elastic one, but in the other cases they are more advanced covers that fold over the grip and is secured with paracord5 and a paracord lock, meaning you can run, climb and jump around without risk of the knife falling out. The sheaths all of course also have a drainage port, a hole, at the bottom for water to run out of. Good paracord cords with cord locks are also included with the sheaths. For the ESEE-5 and ESEE-6 the top portion of the sheaths can also be removed, but not on the ESEE-4. The ESEE-5 and ESEE-6 can also have a separately sold accessory pouch attached to the sheath. Finally, all these blades, grips and sheaths come in different colours, in some cases quite discreet and in some quite bright, like the Venom Green blade with Orange handle. Steel & Hardening: 1095 Carbon Steel, or 440C Stainless Steel, 55 – 57 Rc. The ESEE-4 is the product range equivalent to the Ontario RAT-36 This knife is the little brother of the ESEE-6 and is the closest of the three to being a bushcrafting knife, working quite well for many tasks including chopping down brush, preparing food and carving wood. I wouldn’t use it to baton logs though due to the shorter blade. It comes in two steel variants: The earlier mentioned 1095, but also a 440C Stainless Steel variant. Although I haven’t tried the stainless variant here, 440C is a high-end steel, being a hard and wear-resistant steel. I think, personally, I would prefer the 440C variant, but that is due to my Scandinavian roots, growing up with Swedish stainless Moras that are dead-easy to maintain in the field. The blade is flat ground and has a curved distal tapering with a distinct angle only at the very point, coming from the edge grind. It has a thumb jimping spine and an indented choil for the index finger, to alleviate more delicate tasks. The ESEE-4 can also be had with an orange G10 handle for those who prefer it. As noted earlier, the sheath of this knife is somewhat simpler than those of the other two in that the pommel cover on the sheath is just a simple elastic band. It works well though. Time will tell how it holds up to wear. The retention strap is also secured with velcro instead of a button. Unlike the image below, on my variant, the retention strap folds the opposite way and also has a lanyard hole for easier use. The blade also has grooves for thumb jimping, like on the other two knives. The ESEE-4 in a kydex sheath with detachable MOLLE back, set up for left-handed user. Sheaths are now regular plastic instead. For more details on this knife you can download the ESEE-4 Instruction Sheet. The ESEE-5 is the product range equivalent to the Ontario RAT-57 and is designed specifically as an aircrew survival knife, which thus needs to meet even tougher requirements. This knife is consequently more like an axe than a knife intended for more delicate bushcraft work. It chops like a beast, but doesn’t carve very well, only decently, despite being very sharp. On the other hand the staggering 0.25″ / 6.3mm thickness with no real tapering of the blade (the blade only tapers in the last inch at a distinct flat angle) means it can be used for prying with no risk of breaking, something which would be important to a downed aircrew. The blade has a sabre grind and doesn’t have as distinct an indented choil for the index finger, as the ESEE-4 and ESEE-6 have. It can still be used comfortably with the index finger in front of the grip though. The left side of the grip also has a divot, a retention, which you can use for making fire using a bow drill. Reportedly it works quite well without causing much damage. Here is an example of how it is done. The sheath has a tension screw that can be slid up to lock the knife into the sheath, making it impossible to accidentally fall or even be pulled out. This is a brilliant and simple solution. 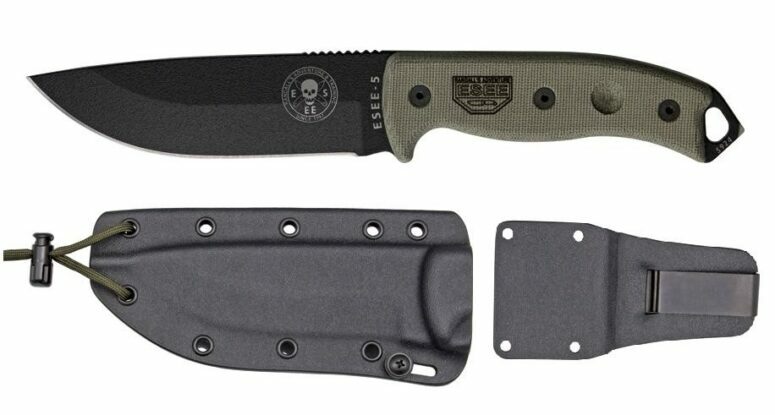 For more details on this knife you can download the ESEE-5 Instruction Sheet. Steel & Hardening: 1095 Carbon Steel, 55-57 Rc. The ESEE-6 is the big brother to the ESEE-4 and the product range equivalent to the Ontario RAT-78 . As can be seen from the data above, this is a pretty big knife with a total length of 11.75″ / 29.8cm, which is 1.25″ longer than the ESEE-5. Still, it is considerably lighter than the ESEE-5, weighing in at 12 Ounces / 340g thus being 4 Ounces / 114g lighter. This is due to a thinner .188″ / 4.8mm blade which is the same as the ESEE-4. The blade is flat-ground and has a gently curved distal tapering with a distinct angle only at the very point, coming from the edge grind. It has a thumb jimping spine and an indented choil for the index finger, to alleviate more delicate tasks. Despite this length it is quite agile and versatile, good for batoning as well as for carving and preparing food. It is thus the most versatile of the three, if not as indestructible as the ESEE-5. The sheath for the ESEE-6 is made out of molded plastic which is good, but I would have prefered it to have the sheath made out of more durable kydex as with the ESEE-5. I am a little bit concerned about how it will hold up to impact in cold winter weather, but temperatures here aren’t low enough to try it properly. Of course an accessory pouch would help protect the plastic sheath. An all-cordura or leather sheath for cold climates would be nice, but can be had from other makers. 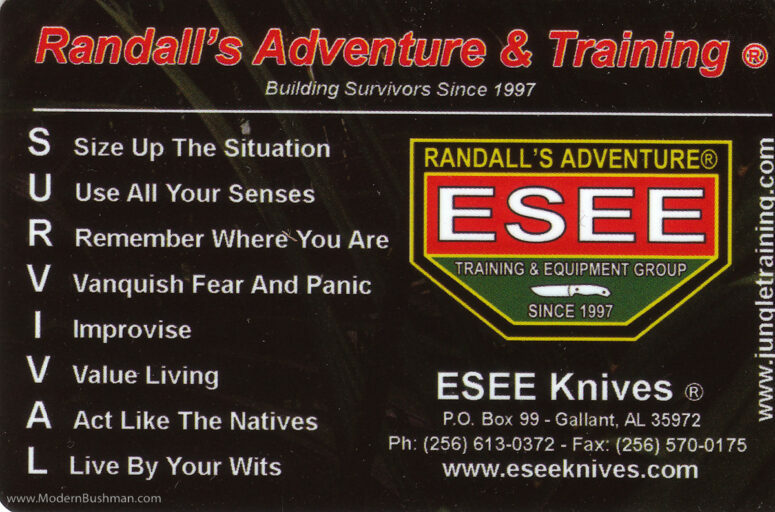 For more details on this knife you can download the ESEE-6 Instruction Sheet. As already discussed, only the ESEE-4 and ESEE-6 are close relatives here and while not being extremes, are still at the opposite ends of typical use, with the smaller knife better for more delicate work and the larger better for chopping. In that sense the two complement each other in regular chores when outdoors. The ESEE-5 is a completely different beast. It is designed as a survival knife for very harsh conditions, where you have no other tools to rely on, instead trusting everything on a single knife. Consequently it needs to be able to slice through fur & skin, chop wood, cut cord, carve wood, break glass, pry doors open, and many other and varied tasks. As often said; ‘a tool designed to do many things will excel at none‘. While this is true for the ESEE-5 also, it still excels in being extremely reliable, meaning you will likely never break it even if you try. It is designed to be able to break almost anything and while it might not break a certain object as easily as a specialized tool, a specialized tool will only be good at breaking what it is designed to break. The ESEE-5 breaks it all. As always, one also needs to keep in mind the use the knife is designed for, in this case downed aircrew in hostile environments and similar situations and needs. With that in mind it should also suit an urban prepping bag, where breaking & prying things and chopping would be more important than cutting thin slices of wood. For Nordic climates and winter use it would have been nice to have the tang covered. Even at 0°C / 32°F it is no fun holding the naked steel of the grip with bare hands. Of course it is fixable with some tape, but I am relucant to do so on such nice knives. Other than that the only slight annoyance would be the laser etching which exposes the steel, meaning it will rust unless cared for. And that is really nitpicking things, as you need to care for the carbon steel edge anyways. Still, it is trickier removing rust from the laser etching than the edge if it happens. If I had to pick one of these knives to use for survival in the Nordic woods, I would likely be picking the ESEE-6, given that it is the most versatile and usable knife of them all, for that context. It can be used both for quite delicate tasks through choiling and jimping as well as for batoning and cutting wood. That said I love how I can smash through thick and twisted logs even in cold winter weather using the ESEE-5, even frozen logs, without fear of breaking it. However, for regular trips I would be bringing a thinner knife with me alongside of it, for those more delicate carving tasks. All these knives and sheaths are of extremely high quality in material and manufacture. Add to that the fact that you can return any broken knife, no questions asked, and even sell it to someone else with that very lifetime guarantee intact and these knives suddenly seem very reasonable priced, even if the investment is initially high in some countries. American stores in particular can have them at extremely reasonable prices though.